Hisao Ueda, executive chef at Kohantei Dubai, tells BBC Good Food Middle East about the kaiseki concept – helmed as Japan’s ultimate, must-try culinary experience. So, what exactly is ‘kaiseki’? In simple terms, it’s best described as an ultra-seasonal, authentic and traditional Japanese multi-course meal prepared by a chef, with great attention to detail and presentation. Until recently, this form of high-end Japanese dining was unavailable in Dubai, but with the opening of Kohantei at Dubai Opera we’re now able to enjoy the immersive experience firsthand without hopping on a flight to Japan. Tell us about the Kaiseki dining experience. What is it exactly? Kaiseki is a traditional multi-course Japanese meal featuring elaborate preparation and exquisite presentation. It is often considered an art form and analogous to Western haute cuisine. Does the menu ever change at Kohantei, to reflect seasonality? Yes, as Kaiseki dining experience is not only enjoying a meal but also experiencing the season. Japanese cuisine is always reflected through seasonal ingredients. At Kohantei we have frequent deliveries from Japan inclusive of seasonal product to ensure that our customers have an authentic experience. As we are one of the only restaurants in the UAE that serves several types of Japanese wagyu, our guests can enjoy five different breeds of Japanese wagyu. It is presented on one plate ‘side by side’ style to showcase the difference of each wagyu grade. I use traditional Japanese cooking techniques and methods to serve wagyu dishes the traditional Japanese way. What other type of ingredients can diners expect to enjoy at Kohantei? We also serve premium seafood along with wagyu. Our seafood comes from fish markets in Japan, Tsukiji and Fukuoka. We serve as sushi and sashimi to enjoy the freshness of the catch. We have a bi-weekly shipment from Japan. We do not have fixed fish list as what we serve depends on the market availability and the seasons. A fish we sometimes use that guests may never have heard of is ‘Isaki’- striped pigfish! In your opinion, what is the most interesting dish on the menu? ‘Two different breeds of wagyu steak served side by side’ is our hero dish. Each of the wagyu has a story behind it and its enjoyable for the customer and for us to demonstrate the difference. All of our kaiseki menus feature wagyu. Tell us more about the ‘no shoes’ policy at the restaurant. Where does this tradition stem from? The origin of this tradition dates back even before the BC10-3 in Yayoi period. Even to this day, all houses in Japan require you to remove shoes as you enter. Many house-designed restaurants also have shoe-off policy and it is a common style, especially with traditional cuisine restaurants in Japan. Is Kohantei a child-friendly restaurant, or better for adults only? We have child policy that we don’t accommodate to below 12 years old because the kaiseki dining experience could be inadvisable for children under 12 years of age. We do however accommodate children on the weekends when the private dining room, suitable for families, is available. What is the difference between kaiseki and omakase? 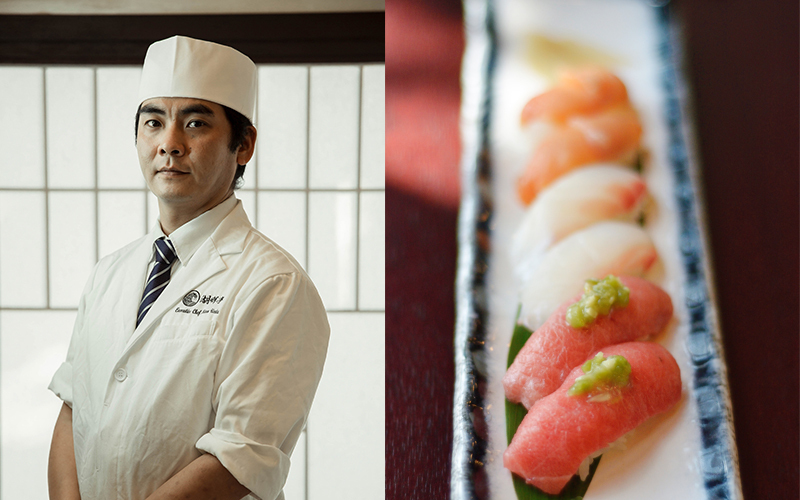 Traditionally Kaiseki dishes are always served by course and prepared with seasonal ingredients. Omakase is ‘today’s chef special’. It could be only one dish, sharing style or course style – the chef is free to prepare his special of the day without any traditional rule. Normally the dish is from the menu and guests do not share any request for the dish except dietary requirement – it’s 100% up to the chef and his creativity. For our readers who are new to dining with chopsticks, what advice can you offer to help them out? Eating with chopsticks is our culture, so we are happy to teach how to use them as a part of our dining experience if someone wishes to do so. We offer ‘easy-chopsticks’ for beginners and if not, we also have a knife and fork. For those looking to dine at Kohantei, what menu option would you recommend the most? The ‘Tsubaki course’ is most popular in Kohantei. This includes the highest grade of Japanese wagyu beef and fresh sashimi imported from Japan. Also, wagyu sushi is served at the end of the course. Or if you are big fan of Japanese beef, then the ‘Matsuri course’ is recommended. This is an eight-course Kaiseki menu, using wagyu for all dishes from start to finish. Details: For more information or to make a reservation, call +971 4 243 4951, e-mail reservations@kohantei.ae or visit kohantei.ae. If you enjoyed reading this interview, you may also be interested in checking out this Q&A with Hiroshima-born Masaharu Morimoto.